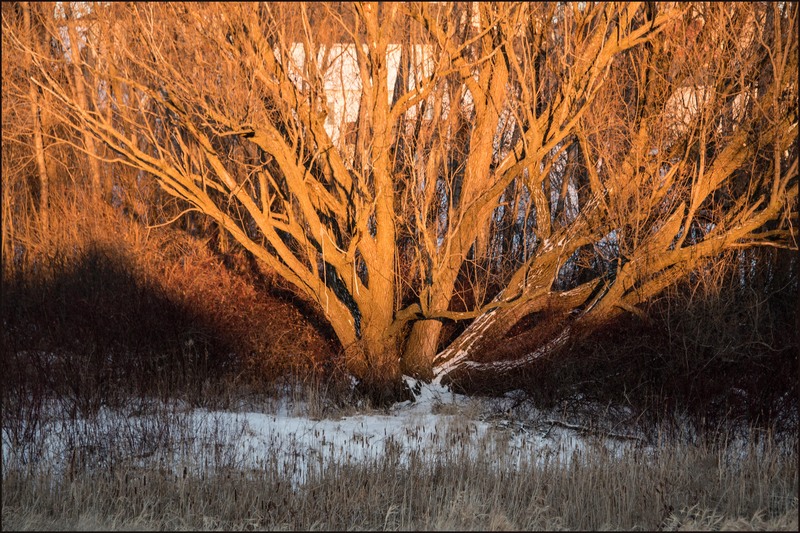 This is my second submission for XDrive Photo Lesson 18 – Golden Hour. We had many cloudy days recently, but once in a while we did see a clear sky. It was too cold to go out, so I took these photos from inside of the house. I didn’t make too many changes in post-processing. They were beautiful (the light) as they were. I want to share them with you, because I believe that beautiful things (or light) are meant to be shared. This maple leaf is probably 10 year old. It has lost all its color, but came alive during the golden hour. 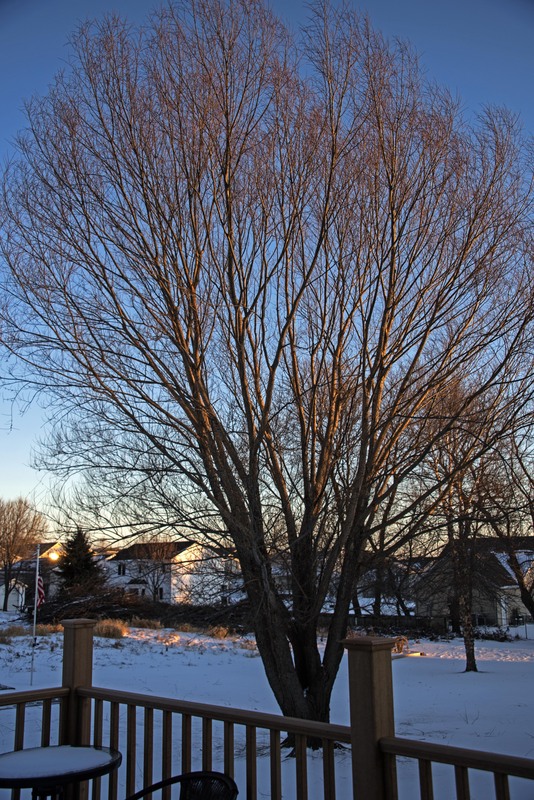 My neighbor’s willow tree looked prettier than other time, too. This entry was posted in photo and tagged XDrivePhoto. Bookmark the permalink. Thank you, Cee. The light really made the difference. We don’t get this kind of light a lot. Thank you so much, Jo. Well, so far, it was like 60 to 70% of the time we got cloudy days. We had a good winter for several years before this year, so I guess I shouldn’t complain too much. According to the weatherman, we will have a sunny day tomorrow and Thursday. Yeah! Really enjoyed that fabulous willow and the light that shone throughout its branches. Good morning, Amy. The light was irresistible. It only happens once in a while. I don’t know why we don’t get that everyday. Hey Helen, great to see another set of images for the golden lights. 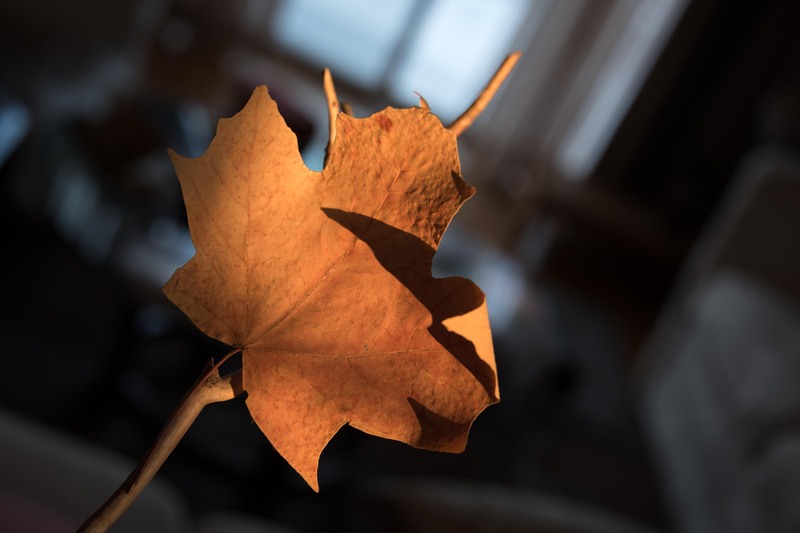 Pic 1: Magic light really brings back life to long-dead leaf…superb capture and indeed it took some time for me to comprehend. Very detailed in full view. Question, why would be background be tilted? Intentional? Pic 2: Neighbours tree looks pretty! Beautiful morning lights hitting the top part of the tree. Wished it lit up the tree completely. Background also complements the image. But just that foreground kind of restricts the vision. Yes, I know its too cold and you are doing a safe shooting. Pic 3: The morning light lit up the tree like bright halogen lamps! Absolutely no shadows that means sun in on top of your head. Why not move your head to the right or left? 😀 Yes, I heard it again.. its cold! Just another month or two, good days coming your way! This comment is part of XDrive’s photography learning sessions. Thanks for the contribution Helen. Thank you, Raj. I always learn something from reading your comments! Pic 1 — I thought tilted background would be more interesting. No? Not even if the background was blurred? Pic 3 — what you wrote made me think. To be honest, I was excited to see the color and didn’t pay attention to the tree trunk. It was when I prepared the photo to post, I noticed it. And at that point, I thought I didn’t have any choice because the tree is on the edge of a utility pond, so I am somewhat restricted. But after giving a long thought and drawing a few pictures of the location of the sun, tree and me, I think if I shoot from neighbor’s yard (probably two doors down), it would work. It’s a good brain exercise. Thank you. Regarding the pic 1 tilt, checked it again. The leaf is tilted and the background is tilted. What if the leaf is upright and the background is tilted or another way around? Do you think it will be interesting? You have a great day now! I tried “leaf is upright and the background is tilted” and I liked it even more!!! 😉 It’s more interesting, I think. Thank you for the suggestion! A lovely and inspiring post. I loved all three photos; Raj’s comments made me go back and look at the photos again. I can see where taking photo lessons like his would be stimulating. #1 I liked the tilted effect. The shadow from the curled leaf was disconnecting to me at first. Then I re-read what you wrote, that the leaf is ten years old. How is that? Oh, you love trees and leaves as much as I do!!! #2 I understand what he means about the foreground. This is something I should think about when I take photos. #3 I am musing on the fact you only were able to see this for a few moments and then it was gone. LOL. Yes, I think we both love trees and leaves. I have many dried maple leaves in my house. I tried to throw some away. Then, I picked more every fall. Ha. I think I picked this particular leaf at least 10 yeas ago. I have taken many photos of it. Golden hour doesn’t last for an hour. Sometime it is quite short. One day I looked out of my window; I thought the light was pretty good. I hurried to put on warmer clothes. And you know what? After I dressed up, the light was gone. I wasn’t very happy. I love the photo of the leaf! Dear~ Yes, I am back from retreat. This year, Rinpoche talked about Karma a lot… I loved the teaching very, very much. However, I am not sure if my readers are ready to accept it… (lots of them are Christians). I Think I will write more on the emails to you! Thanks for sharing. Have a great day. I would love to share more, hopefully, in the email! Thanks, Julie. Golden hour is quite magical, isn’t it? Everything is glowing during that time… It’s my favorite time of the day.